The next time you visit Beijing you may want to get your sled ready. 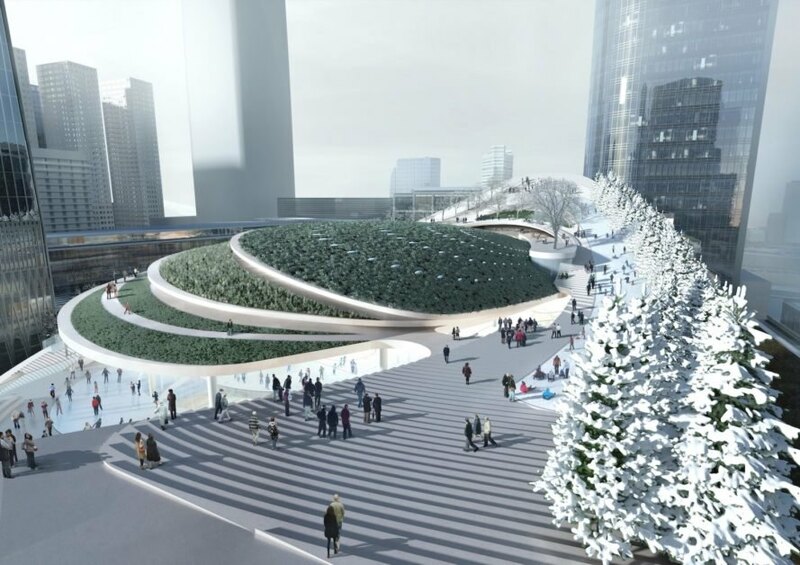 China’s ever-evolving capital will soon be home to a stunning new civic center topped with an artificial snow-covered slope perfect for skiing and sledding. 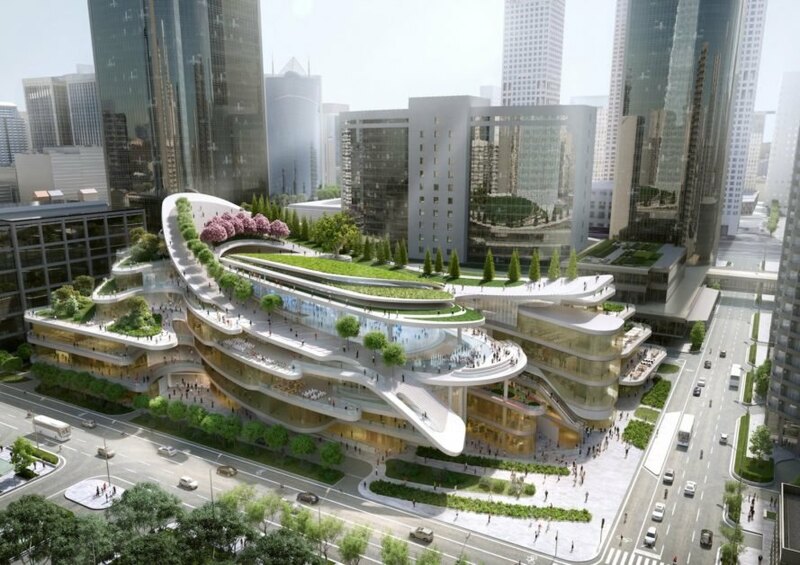 Designed by architect Andrew Bromberg of Aedas, the civic center, called the China World Trade Center Phase 3C, will merge energy efficient principles with mixed-use programming that accommodates the arts, outdoor recreation, and even organic farming. Set for completion in 2020, this extraordinary project is the final piece of the China World Trade Center masterplan, which includes Beijing’s two tallest towers to date in the city’s business district. With its eye-catching sculptural shape and ample green space, the Phase 3C development will serve as an anchor and gateway to the complex. Instead of massing the buildings around a single street-level civic green, Bromberg elevated the green space to the upper level to create a series of green terraces outfitted with seating and large trees. The shape of the elevated building dips towards the street corner but gently lifts up towards the tall towers. 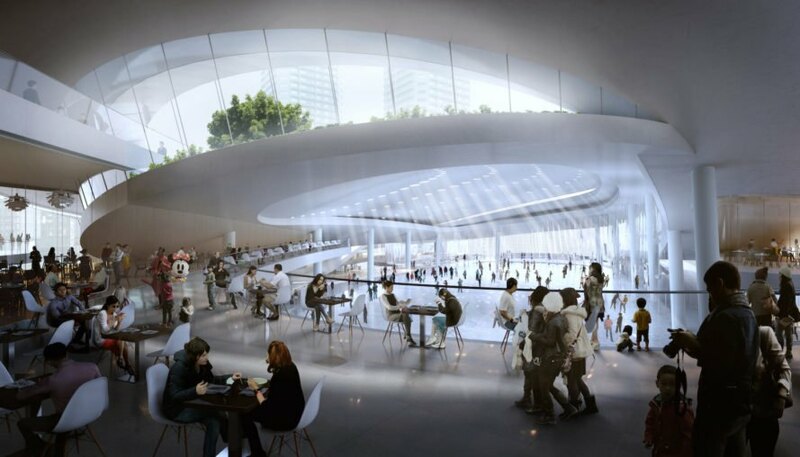 An Olympic-sized indoor ice-skating rink will be located directly below the largest roof garden, which sits above multiple levels of retail. Parking is tucked beneath ground. 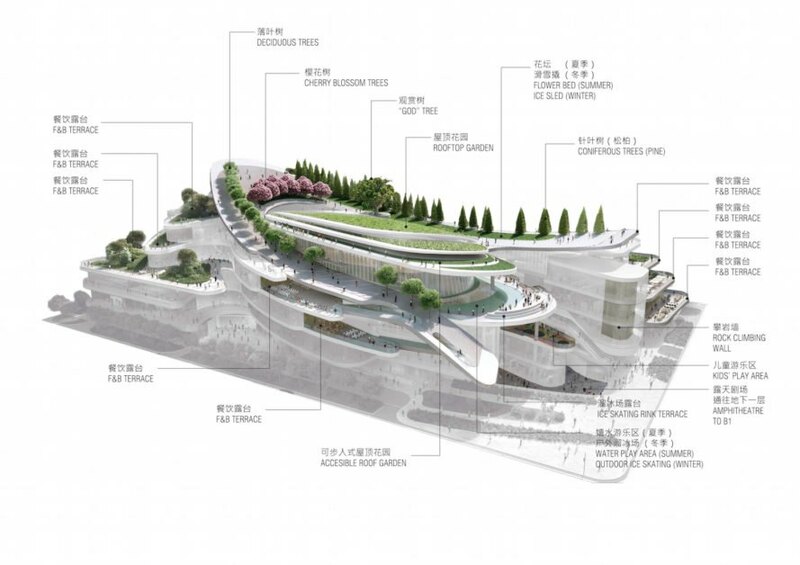 The building will also include an amphitheater, art studios, exhibition spaces, an organic farm, cultural and educational facilities, a rock climbing wall, theater, and a water play area that can be converted into an outdoor ice skating rink in winter. The crown jewel of the project is the sloping hill at the crest of the building that, with the use of artificial snow, will be turned into a slope for skiing and sledding during the colder months. To lower its energy footprint, the building will be clad in low-e, low-iron glass and is designed to maximize indoor access to natural light to reduce electricity demands. Existing trees will be transplanted onto the roof of the development and the natural landscaping will help reduce the city’s heat island effect and solar gain. Specially chosen plants and an efficient irrigation system are expected to reduce the project’s landscape requirements by as much as 30 percent as compared to the project baseline for the peak watering month. Water Efficiency Labeling Scheme (WELS) rated water fittings will also be used. The project will begin construction in August 2017. 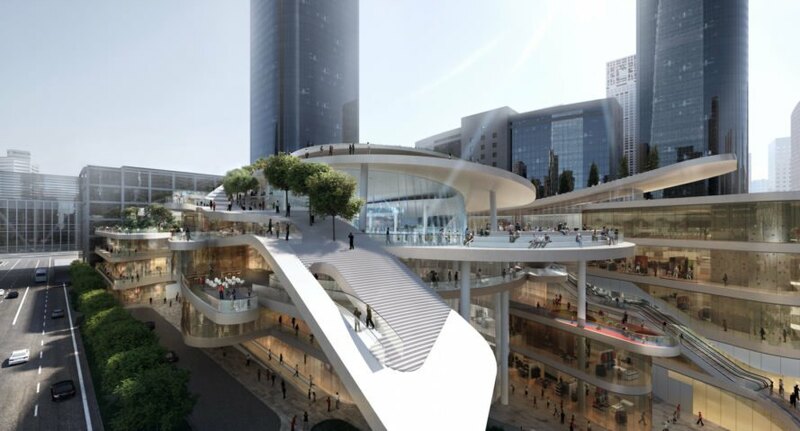 Set for completion in 2020, this extraordinary project is the final piece of the China World Trade Center masterplan, which includes Beijing’s two tallest towers to date in the city’s business district. With its eye-catching sculptural shape and ample green space, the Phase 3C development will serve as an anchor and gateway to the complex. Instead of massing the buildings around a single street-level civic green space, Bromberg elevated the green space to the upper level to create a series of green terraces outfitted with seating and large trees. The shape of the elevated building dips towards the street corner but gently lifts up towards the tall towers. 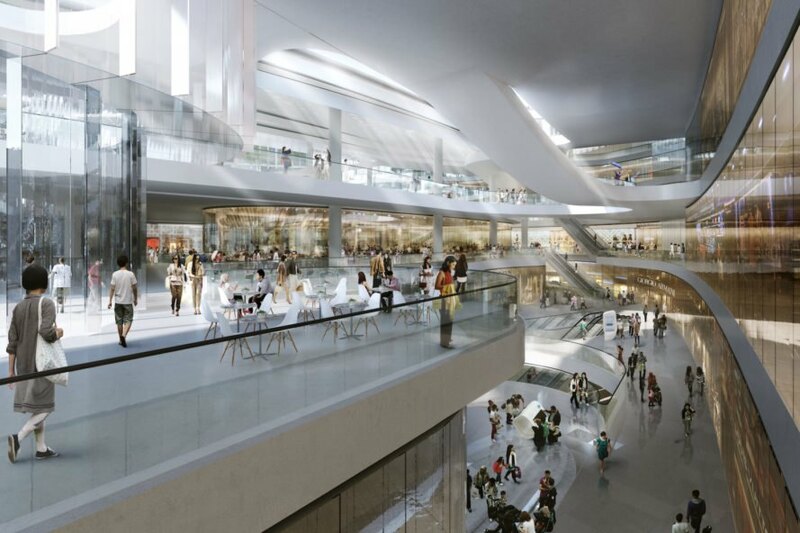 An Olympic-sized indoor ice-skating rink will be located directly below the largest roof garden, which sits above multiple levels of retail. Parking is tucked beneath ground. 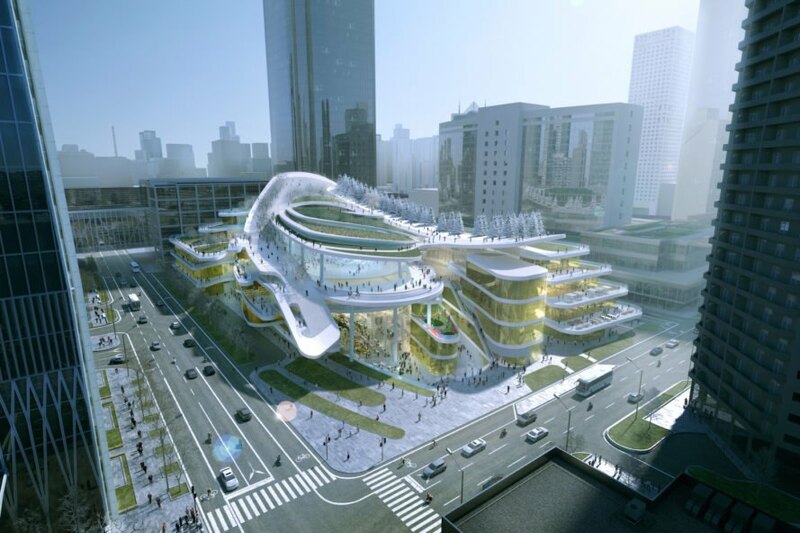 The building will also include an amphitheater, art studios, exhibition spaces, an organic farm, cultural and educational facilities, a rock climbing wall, theater, and a water play area that can be converted into an outdoor ice skating rink in winter. The crown jewel of the project is the sloping hill at the crest of the building that, with the use of artificial snow, will be turned into a slope for skiing and sledding during the colder months.